How many bombs were dropped? 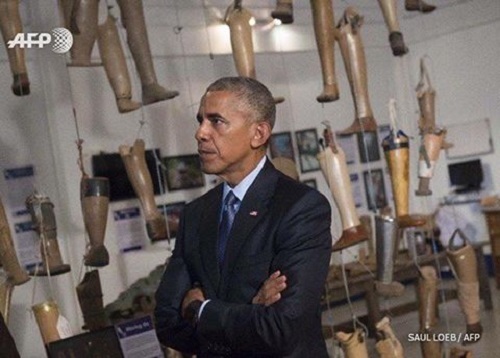 President Obama described Laos as the most heavily bombed nation in history. Eight bombs a minute were dropped on average during the Vietnam war between 1964 and 1973 – more than the amount used during the whole of World War Two. The US flew 580,344 bombing missions over Laos, dropping 260m bombs – equating to 2m tons of ordnance, with many targets in the south and north struck time and again as part of efforts to isolate Communist North Vietnamese forces. Most devices dropped were anti-personnel cluster bombs. An estimated 30% of these munitions did not detonate. Ten of the 18 Laotian provinces have been described as “severely contaminated” by unexploded ordnance (UXO). Mine-clearing agencies estimate that about 288m cluster munitions and about 75m unexploded bombs were left across Laos after the war ended. Why are cluster bombs so reviled? Cluster bombs scatter explosives across a wide area and often fail to detonate on impact. They pose a significant threat to civilians because of both their impact at the time of use and their deadly legacy. Launched from the ground or dropped from the air, cluster munitions consist of containers that open and disperse sub-munitions indiscriminately over a wide area. Many explosive sub-munitions, also known as bomblets, fail to detonate as designed, becoming landmines that kill and maim indiscriminately. They are difficult to locate and remove, posing a danger to civilians long after conflicts end. Children are particularly at risk, as they can be attracted to the bombs’ toy-like appearance. The Convention on Cluster Munitions bans the stockpiling, use and transfer of virtually all existing cluster bombs, and also provides for the clearing up of unexploded munitions. It has been adopted by 108 states, but not the US which, according to some estimates, spent as much on clean-up efforts in Laos between 1995 and 2013 as it spent in three days of bombing during the war. Laos is likely to ask for an extension to its commitment to get rid of UXO when Convention member states next meet in August 2020. How many people have been killed by UXO? The number of casualties from air-dropped explosive devices – mostly cluster munitions – in Laos since 1964 is estimated by the Landmine and Clustering Munition Monitor to be around 50,000 people. Of these about 29,000 people were killed and 21,000 injured. The overwhelming majority were civilians. Today only a handful of people are killed and injured, the figures show. But the threat posed by UXO stops villagers from getting to their farms and renders vast tracts of agricultural land useless until they have been cleared of munitions. Will more US money address the problem? The president’s announcement has been widely welcomed by aid agencies working to address the UXO problem in Laos, which include the Halo Trust, the Mines Advisory Group, Norwegian People’s Aid, UXO Laos and Handicap International. “The president’s announcement is extremely good news for us and for poor families in rural areas who lives are still blighted by UXO. Likewise Halo Trust CEO James Cowan said the president’s announcement will have a profound effect on the people of Laos. “It will help them live and farm in safety on their land, as well as creating opportunities for development and infrastructure,” he said. What role can surveying play? “Today more than ever we are getting a much better grasp of the scale of the contamination,” Norwegian People’s Aid (NPA) Senior Advocacy and Research Advisor Lucy Pinches told the BBC. Aid agencies have also gained access to Pentagon bombing records so that they can identify which areas of land – mostly the Ho Chi Minh Trail in the south and the Lao communist party headquarters in the north – were bombed and likely to contain unexploded bombs. “More partnerships in the last couple of years among international clearance NGOs has greatly helped in pushing this process forward,” NPA Laos Country Director Jonas Zachrisson told the BBC. But at the same time he cautions that “much of the country remains unsurveyed with limited data regarding the extent, scope and nature of the problem”. How are Laos-US relations today? President Obama is the first US president to visit Laos and has adopted a noticeably conciliatory approach towards his hosts. He said that the US bombings had destroyed “villages and entire valleys, killing countless civilians”. His approach has been welcomed by Laotian President Bounnhang Vorachit as a way of enhancing mutual trust between the two countries after the devastating war. The president in return has promised the government will step up its efforts to locate and return US servicemen missing in the war.